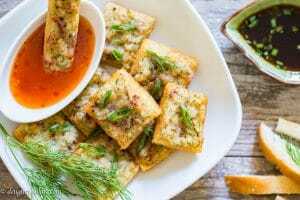 Vietnamese Squid Cake on Toast is a quick and fun appetizer. 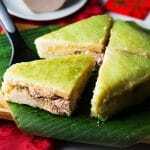 It has a crispy layer of sandwich bread and a flavorful layer of tasty squid cake. 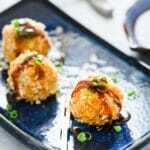 The squid cake is packed with flavor of the sea and light aroma from dill. 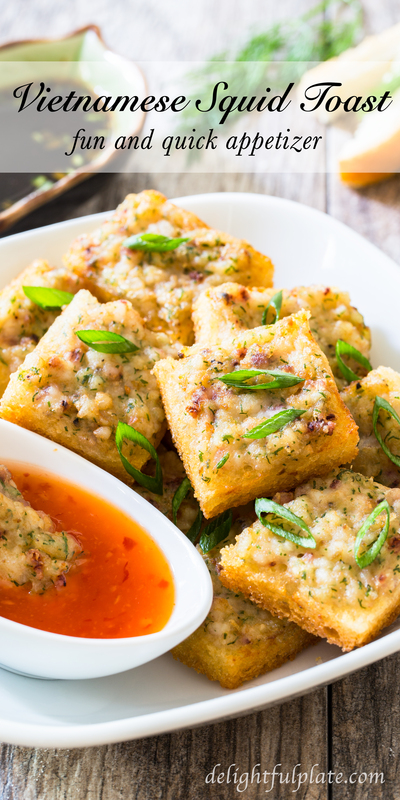 This dish is a fusion of Vietnamese cuttlefish cake (cha muc) and Chinese shrimp toast. 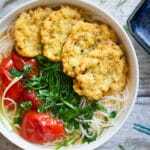 Vietnamese cuttlefish cake (cha muc) is a fried patty made from cuttlefish with a bouncy and slightly chewy texture. It is especially popular in seaside cities in Vietnam. Nobody in Vietnam can make more delicious cuttlefish cakes than my uncle; I’m not kidding! My first attempt making them myself didn’t go as planned. I was freaked out because the texture wasn’t what I expected though my method was the same as my mom’s or my uncle’s. I asked my mom why, and she explained to me that the cakes are usually made from cuttlefish. It’s such a shame that I ate it all the time and didn’t know it is made from cuttlefish instead of squid. After googling, I learned that cuttlefish is not available in the U.S. despite being widely available in Asia, Western Europe and the Mediterranean. According to wikipedia, they prefer temperate/tropical ocean waters and the North Atlantic is possibly too cold for them. So my only choice is thin squid at my local grocery store. The cake is still very flavorful when made from squid. However, it doesn’t have the same texture as the one made from cuttlefish. Squid cake is softer with just a tiny bit of a chew. 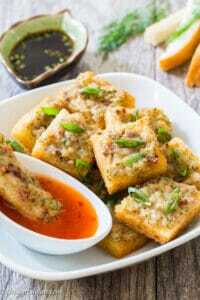 Therefore, I decided to borrow the idea of Chinese shrimp toast with the hope to make the texture more interesting. I spread the squid paste on top of sandwich bread and then fried until crispy. 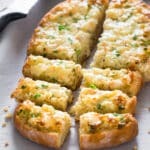 It turned out to be a great appetizer! Two main ingredients needed to make Vietnamese Squid Cake on Toast are squid and white bread. It’s best to use thin sandwich bread slices, so it’ll take less time to fry them and they will absorb less oil. My suggestion is the bread slices shouldn’t be more than 1/2-inch thick. You should use a generous amount of oil and wait until oil reaches 350F to start frying. As for the squid, the method to make the squid paste is similar to making fish cakes in my Fried fish cake noodle soup recipe. You just need to put them in the freezer for 30 minutes or an hour so that they become really cold. 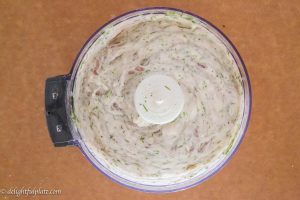 Throw them in the food processor, add garlic, shallot, dill, black pepper, cornstarch, and process into a paste. There’s no need to add any salt or fish sauce because squid already has a high level of salt. You can serve the squid toast with sweet chili sauce or vinegared soy sauce. 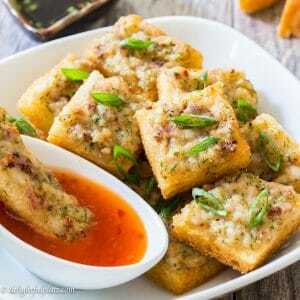 Vietnamese squid cake on toast is a quick and fun appetizer. 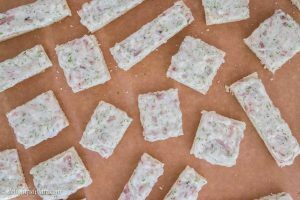 You can even prepare a big batch for a party in a short amount of time. It has a crispy layer of sandwich bread and a flavorful layer of tasty squid cake. Before cooking, put squid in the freezer for about 30 minutes (optional). Wash and pat squid as dry as you can. 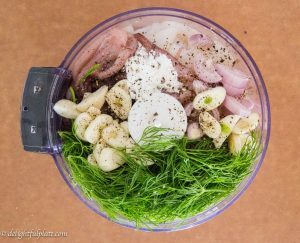 Add squid, garlic, shallot, dill, cornstarch and black pepper in a food processor. Process into a smooth and sticky mixture. 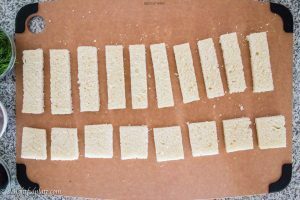 Remove the crust from bread slices and then cut bread into squares, sticks, or whatever shape you like. Spread 1 1/2 to 2 teaspoons of squid mixture onto each piece of bread. Heat 1 inch of oil in a frying pan. Once oil reaches 350F, add the squid toasts with the squid side down. Cook only a few toasts at a time. When the squid side has turned golden brown, about a minute, flip and fry the bread side until golden brown. Transfer to a plate lined with paper towel with the bread side touching the paper towel to drain oil. Whisk together all ingredients for the vinegared soy sauce. Serve squid toasts hot with either the vinegared soy sauce or sweet chili sauce.